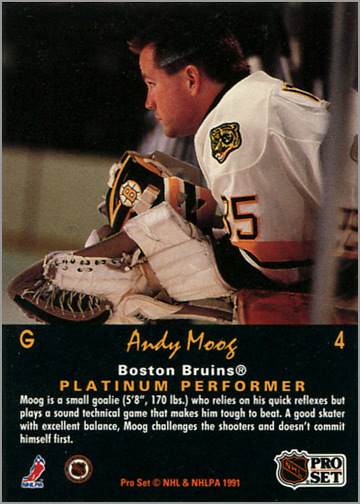 Now, 25 years later, I think it would be fun to take a look back at the first, last and only set of Pro Set Platinum hockey cards. 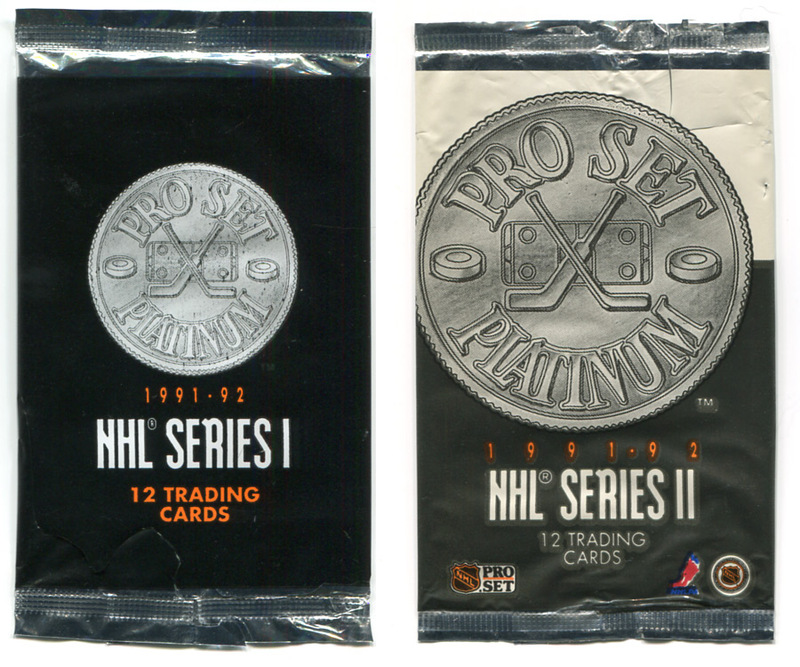 1991-92 Pro Set Platinum Series One came out in late 1991, while Series Two came out towards the end of the season. 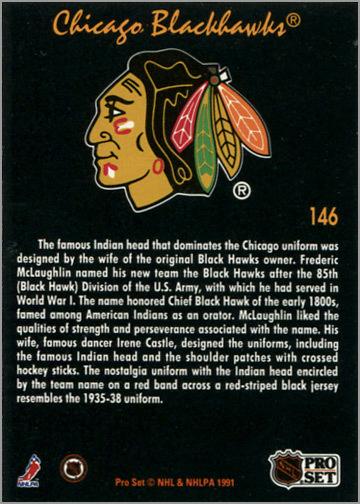 Each series had 150 cards for a total of 300 cards. 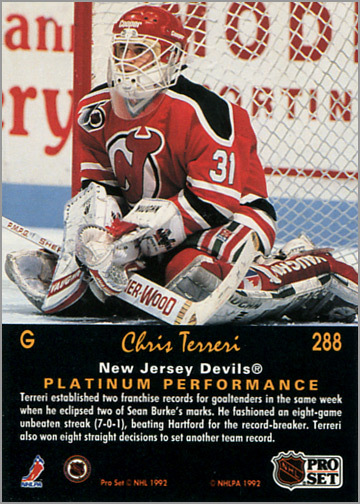 There were also 20 insert cards, for a grand total of 320 Pro Set Platinum cards. 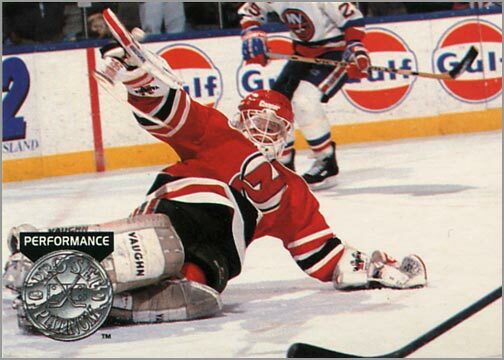 Platinum was about half the size of the standard Pro Set hockey set — 300 total cards, as opposed to the 615 cards issued in Pro Set Series One and Two. Therefore, Platinum focuses on each team’s best players. However, it also has a lot of players who signed with new teams over the summer or were traded that season. 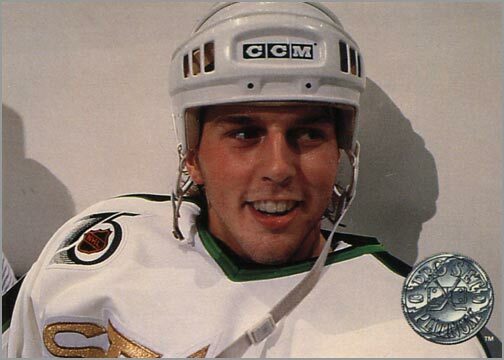 So, it is basically stars and traded guys. 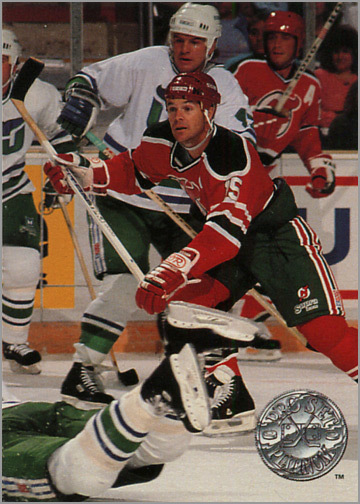 Getting cards of players in their new uniforms was pretty exciting back then. Normally, we’d have to wait a full year to get cards of players with their new teams. 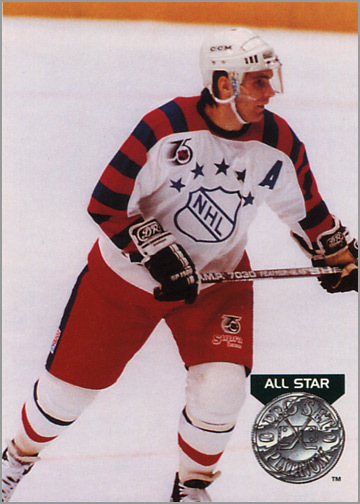 Pro Set Platinum Series One was also the first set to have game-action photos of San Jose Sharks players, as well as players from Original Six teams wearing their throwback uniforms. 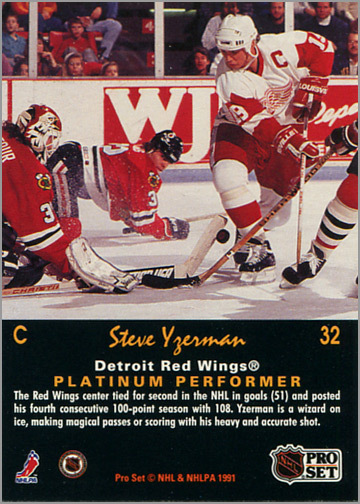 In fact, a lot of the cards use photos taken earlier in the 1991-92 season — sometimes from just a few months ago — making Platinum feel very current at the time. The front of each card consists of a full-bleed photo and a circular Pro Set Platinum logo. And that’s it. Pro Set Platinum is awesome because the design is so simple. 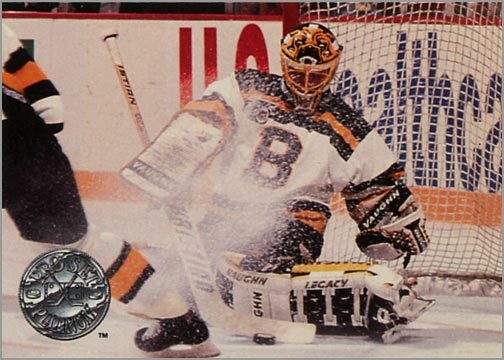 What I absolutely loved was that these cards had more gloss than standard cards, and no borders — making each card feel more like a mini photograph and less like a trading card. The Platinum logo is unnecessary, and sometimes distracting, which is why the design does not receive a perfect score. 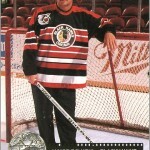 It would have been really gutsy for Pro Set to not have any logo on the front, and let the pictures do all the talking. 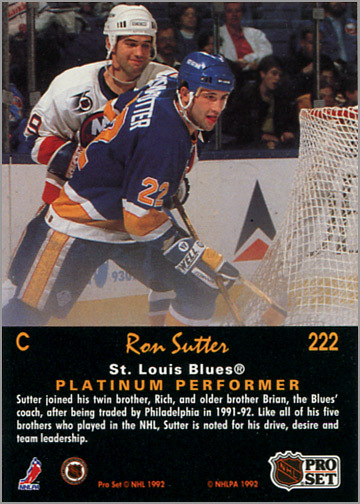 #222 – Ron Sutter (view back). 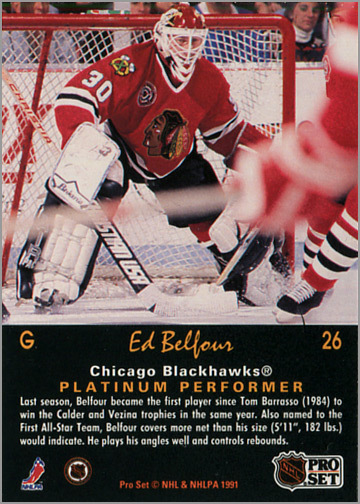 Worth mentioning is that some of the cards have photos where the main player is in color but the other players and the background are in black and white. This was a clever way to highlight who the subject was meant to be in pictures where it was not readily apparent. This technique has been done to death since 1991, but back then was a fresh idea. There are no stats on the back, but so what? 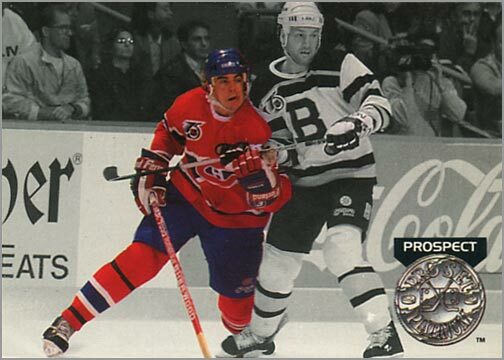 Instead, Pro Set Platinum uses 2/3 of the card’s backside to show another picture — often a candid or close-up shot of the player. Sometimes, the photo on the back was as good, if not better, than the photo on the front. 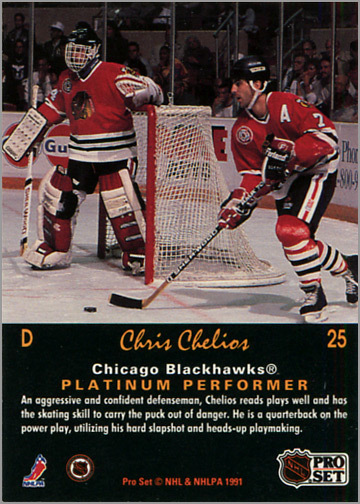 Beneath the picture is the player’s name, position, the card number and a short write-up on why the player is a “Platinum Performer.” Again, this was a fresh idea at the time; a hockey card that didn’t belabor stats and vitals like height and weight, but instead briefly explained why this player was good. 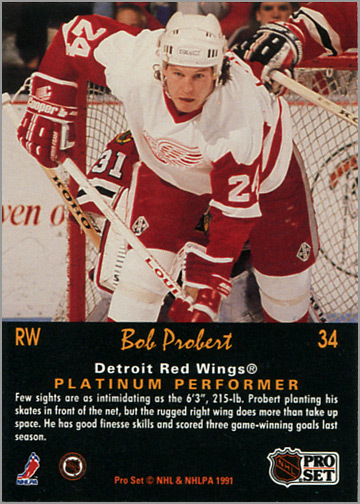 Pro Set Platinum also had a few subsets. 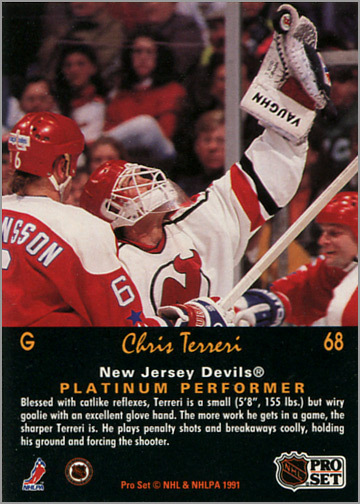 Most highlighted players and happenings from the 1991-92 season, though a few cards look back at the previous year. 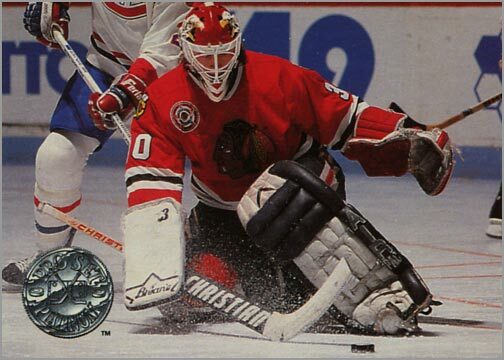 Playoffs (5) – These five cards focus on the division, conference and Stanley Cup Champions for the 1990-91 season. 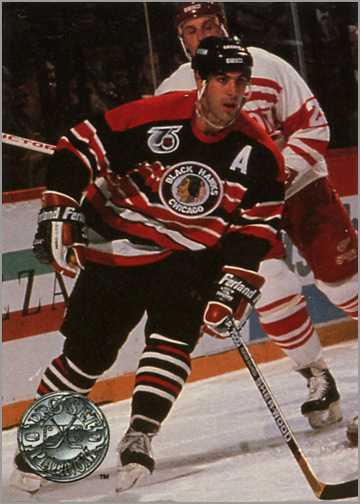 Original Six Uniforms (6) – Six cards show off the special anniversary sweaters that were worn by the Original Six teams during the 1991-92 season. 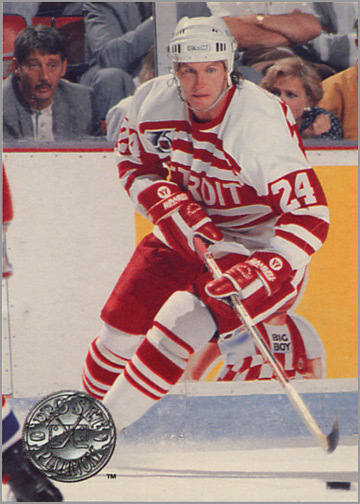 Platinum Prospects (27) – Cards of players whose rookie season was in 1991-92, including Nicklas Lidstrom, Dominik Hasek and John LeClair. 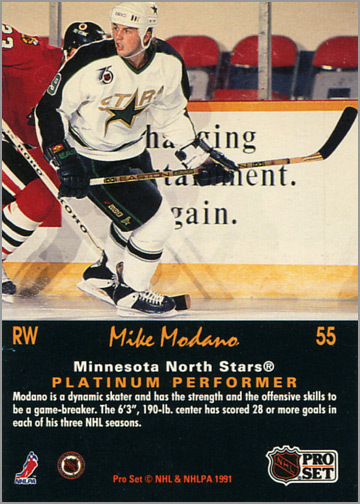 Platinum All-Stars (6) – Six cards of players who appeared in the 1992 All-Star Game. The cards also recap the Skills Competition and the All-Star Game itself. 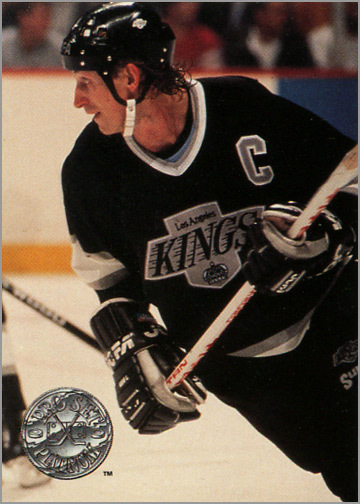 Platinum Performance (7) – Platinum Performance cards key in on players who achieved a team or league milestone during the season. 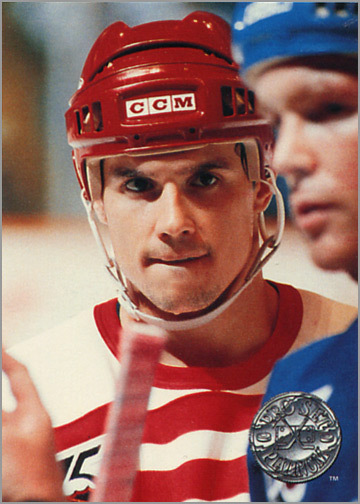 Celebrity Captains (12) – During the 1991-92 season, which was the NHL’s 75th Anniversary, each team had a celebrity captain; some even had two. 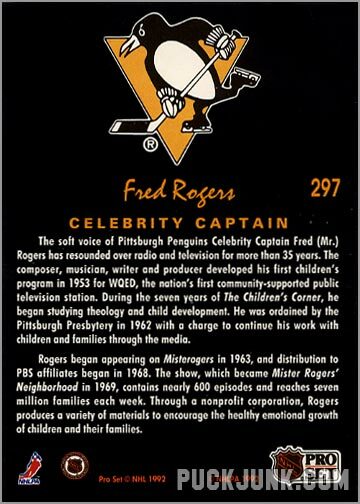 Pro Set made cards of several Celebrity Captains, including Larry King (Capitals), Jim Belushi (Blackhawks), Ralph Macchio (Islanders) and Fred “Mister” Rogers (Penguins). 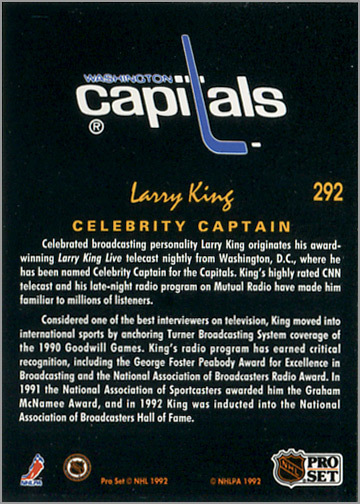 Unfortunately, only a dozen Celebrity Captains had cards, and not all of them. A pack of Pro Set Platinum had 12 cards. Each box had 36 packs, yielding a total of 432 cards. Collation was pretty good for Pro Set. 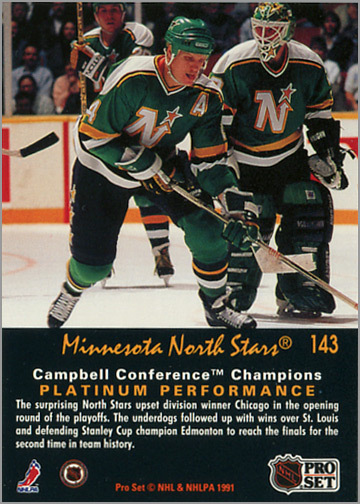 I recall getting two full 150-card sets from a box of Pro Set Platinum Series One. 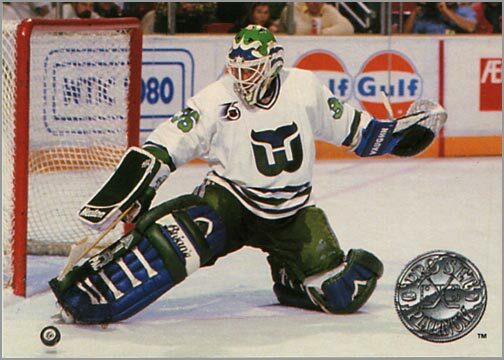 If you happen to remember what a pack of these cost back in 1991-92, please let me know. 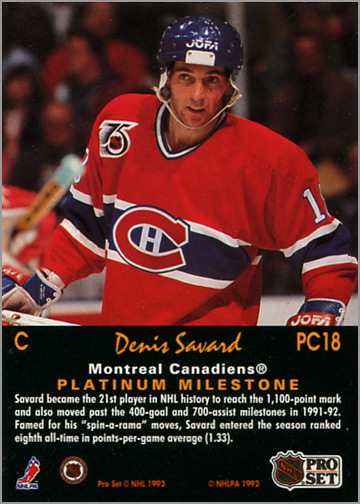 Unlike Pro Set’s other two major releases in 1991-92 — Pro Set Series One and Two, and Parkhurst Series One and Two — Platinum did not have a French-text version. A special, faux-leather Pro Set Platinum three-ring binder was available for purchase through Pro Set’s mail-order catalog. 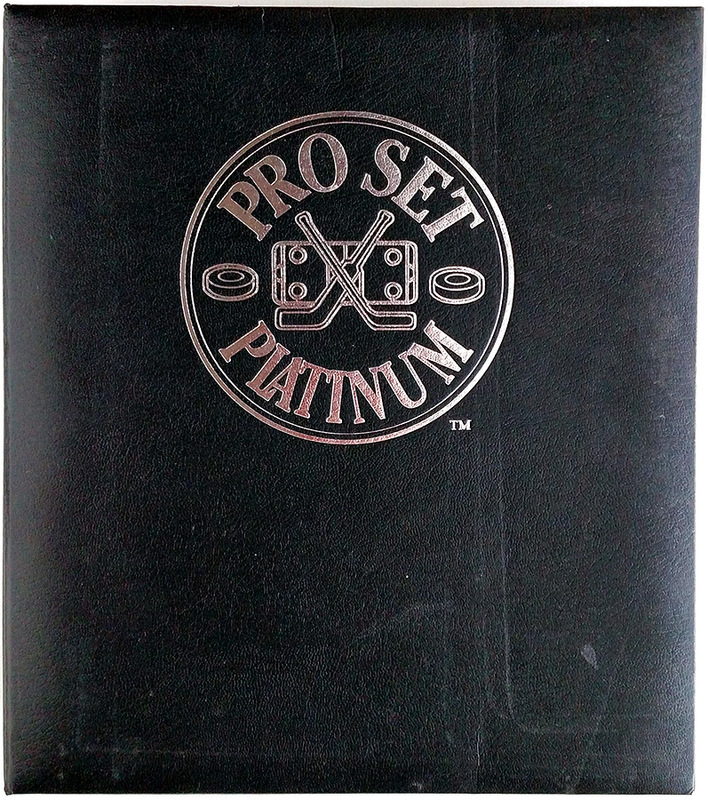 The binder had the Pro Set Platinum logo printed in silver ink on the front and on the spine. 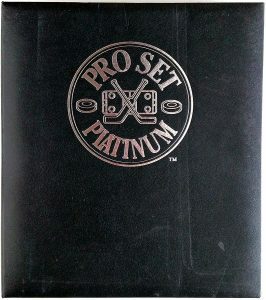 I am not sure of the price, but other binders made by Pro Set sold for $7.95, so it is safe to assume that this sold for around that price too. Pro Set Platinum was pretty awesome when it came out. Photos were as current as possible, and printed without borders. The cards were super glossy, too. All of these features made Platinum feel like a premium set of cards for its time. They didn’t even need stats to be great. While Platinum may not be the best (or even second-best) set from 1991-92, it is still a worthwhile — and cheap — pickup. It nicely showcases the NHL’s 75th anniversary season without getting too unwieldy. I like them other than the font used on the name. 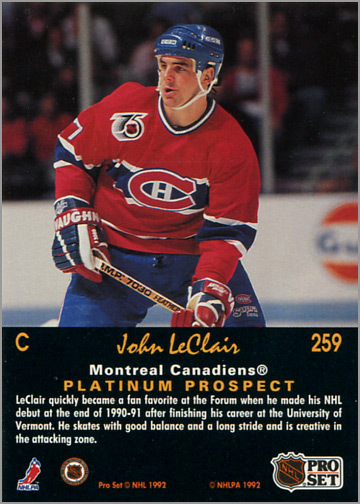 I came late to the hockey game and when I was given a stack of these last year, many of them were the first time I was learning of the player’s existence and the faux cursive they chose left me second guessing wheather I had their names correct. 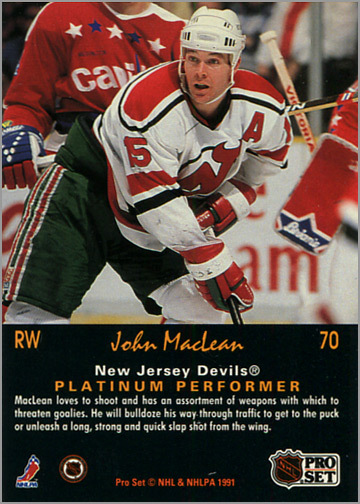 Also, this is the first major modern set in any sport I am aware of to not have names on the card front. True, the faux-handwriting font was kind of annoying. 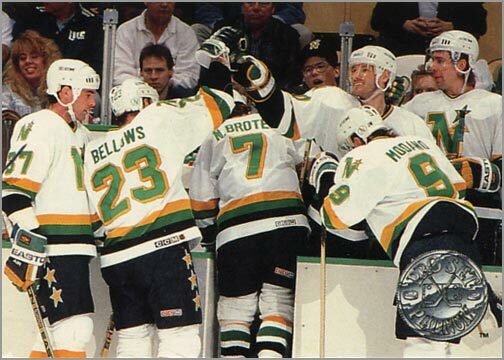 I don’t think it bothered me much back then because I knew all of the players anyway. 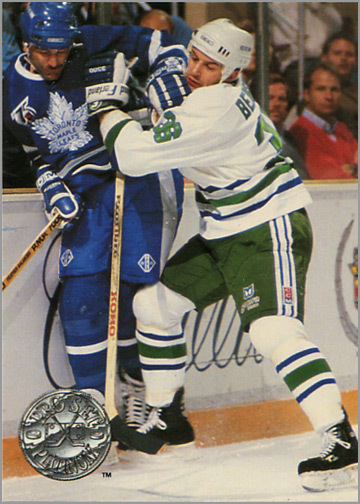 I remember the stores charging $2 per pack for these cards. But that’s in Canada so it might have been $1.50 in the USA. 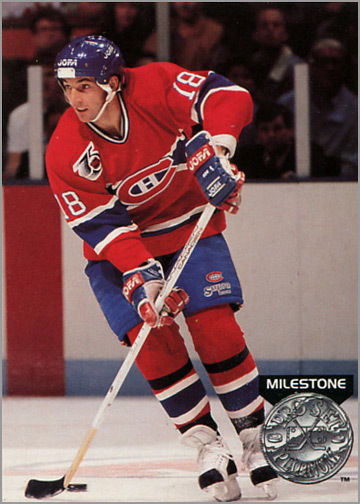 They were pricey but in 91-92 the Gretzky went for $5 and everyone thought every card released would end up being worth as much as cards were prior to 1988-89 cards. We went nuts for this junk. 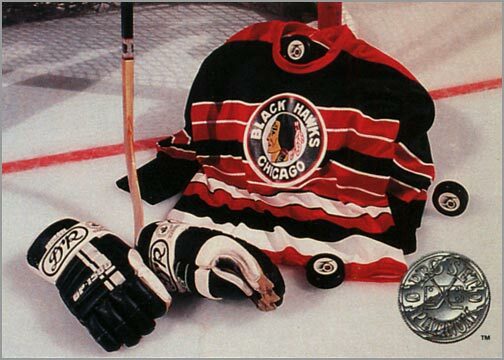 As worthless as PSPlatinum is now, they were pretty nice. These and Parkhurst were defiantly the best cards of that season. 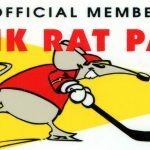 Even the UD and OPC Premier sucked. 91-92 is truly the worst card year ever, and ever will be. Hi Christopher. Thank you for your comment! 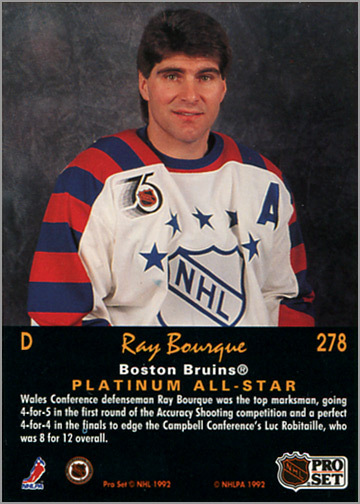 I don’t know if I’d agree with 1991-92 being the worst card year. Yes, everything was overproduced, but I think the card companies pushed the envelope further than “Let’s make a big set and call it a year.” There were Series 1 and 2 sets, update sets, premium sets, even sets that came with candy. 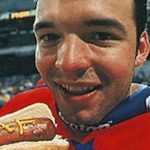 I think 1991-92 was a fun year because there was so much to collect! Holy nostalgia, Batman! I absolutely loved this set when it came out. I’ve been a silent reader for a while now, but I just want to say that i’m loving the site. Keep up the good work, Sal! Hi Brent, thank you for the compliments. I am glad to hear that I’m not the only one who loved Pro Set Platinum when it came out. Hi Sal! Long time reader, and first time commenter here. One of my favorite hobby-related sites that I have bookmarked. Keep it up! I recently grabbed some sports cards I had stored at my parents house, and found Series I of this set that I’d purchased years back. I love the design, and though they lack the traditional stats lines on the back, it’s still most likely the best Pro Set had to offer (whatever that’s worth). 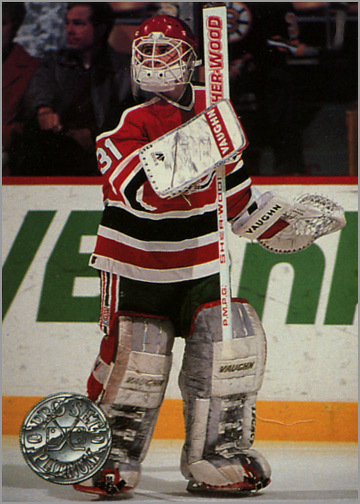 I’m glad you highlighted the Ron Hextall card because it was the one that jumped out to me after flipping through the set once again. Dan, good to see you commenting after all these years(? )…I assume years. Yeah, the lack of stats wasn’t a problem for me either. I loved the full photo on the front, and the large picture on the pack. It was all about the photos with Platinum. I’m sorry the set didn’t last another year. Then again, I wish Pro Set was still around today. Ahhh Pro Set Platinum, part of Pro Set’s too little too late. I really wasn’t too sure what to think of these when they first came out. 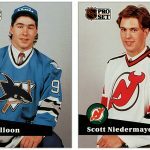 Sticker price was high for “Pro Set” but much like their Parkhurst cards I felt they were really well done and offered collectors something different than your standard card. The photography and card quality were both solid and the write-ups on the backs were good. 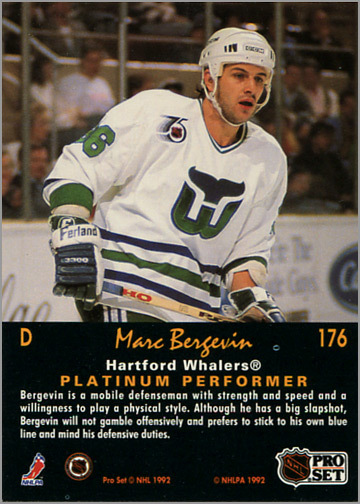 My only real complaint was the inconsistent use of black and white on some cards and not others. 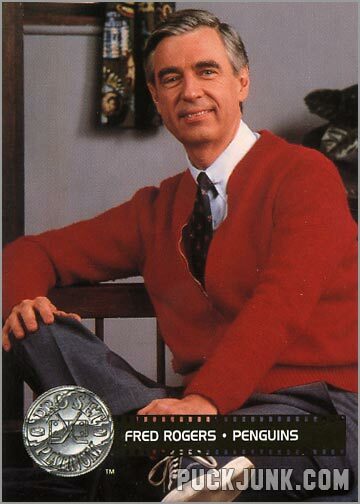 I had the first series done back in the early 90’s and since then I have bought the series 2 set and all the PC cards which I think were a cool idea and a must have. Unlike lots of my 90’s sets, this one is in a binder and pages and gets looked at every few months and I always spot something new or cool with the set. Great review Sal! At that time, I remember thinking the black & white cards were SP. 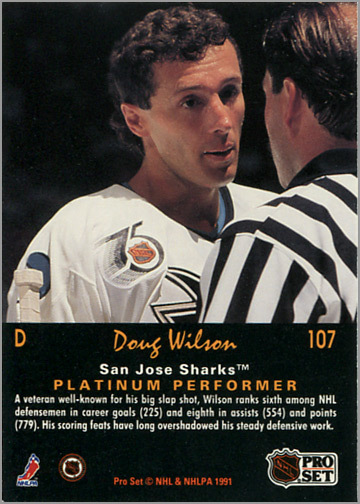 As you pointed out, this was the first in-action Sharks cards. Thanks, John. 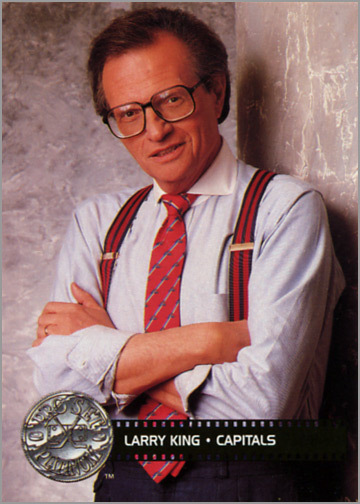 I agree about “book value” — in fact, I downplay the whole “value” thing, which obscures the real reasons for collecting. 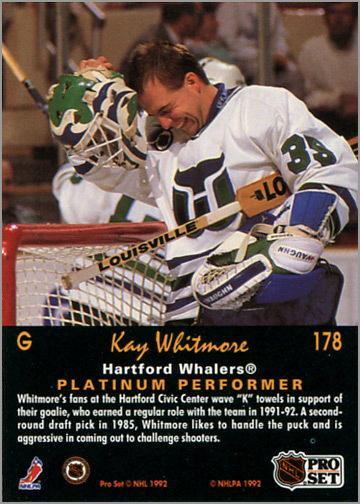 I just found 27 packs of the 1991-1992 pro platinum series cards. What’s the chance of finding Wayne Gretzky. Don’t say none because I am giving these to my boyfriend and that is his favorite player. 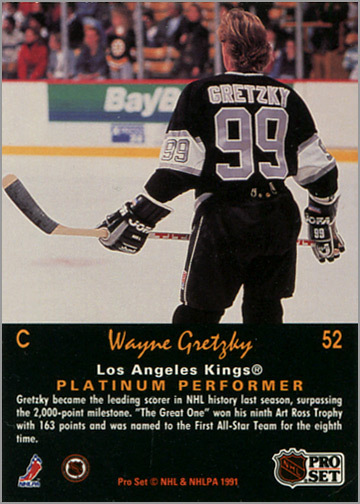 At 12 cards per pack (and 150 cards in Series One), your odds of getting a Gretzky card are 1 in 13 packs, assuming that they are all Series One packs. Good luck. They are all series one. Thank you and I hope he finds one too. Such a fun set. 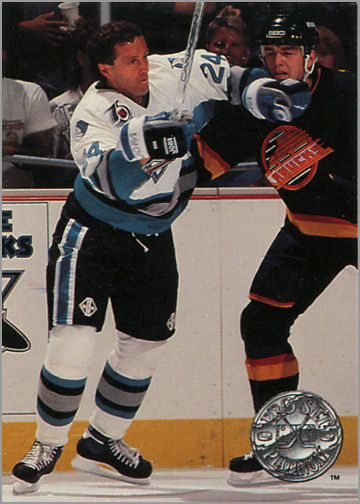 Absolutely remember it being the first set to include action shots of Sharks’ players. 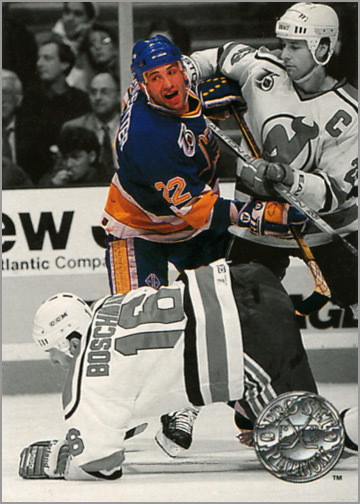 For all the ‘retro’ cards made in the last decade, I would like to see this one dug out. Great post.